Reconciliation is the act of God whereby He does away with the hostility between a sinner and Himself and establishes peace. Reconciliation was necessary because of our sin (Romans 5:8-11). Reconciliation was accomplished by the cross (Colossians 1:19-22). Reconciliation produces peace with other believers (Ephesians 2:14-18). Reconciliation is a message God wants us to share (2 Corinthians 5:17-21). Greek and Hebrew Interlinear Bible - I use this study tool often in my sermon preparation. Muddy River Media - This site offers free media resources to churches. It's run by a personal acquaintance. Obamaicon.Me - Make your own Obamaicon (your image in a style inspired by the famous Obama poster). In pagan religions, it was believed that man could appease an angry god by offering gifts or sacrifices. This was propitiation. Biblical propitiation is much different. Our sin does anger God, but it is not the sinner who offers the propitiation. "God set forth [Jesus] as a propitiation by His blood" (Romans 3:25 NKJV). "In this is love, not that we loved God, but that He loved us and sent His Son to be the propitiation for our sins" (1 John 4:10 NKJV). Redemption is deliverance by the payment of a price. The price paid is called a ransom. Jesus declared, "The Son of Man did not come to be served, but to serve, and to give his life as a ransom for many" (Mark 10:45). The ransom price that is able to redeem us is the blood of Jesus. "It was not with perishable things such as silver or gold that you were redeemed from the empty way of life handed down to you from your forefathers, but with the precious blood of Christ" (1 Peter 1:18-19). BibleGateway.com - An excellent site for searching for words or phrases in the Bible. Ransom Note Generator - Found this while preparing for my message on redemption. MLB Trade Rumors - A great place to keep up on rumors of MLB trades and signings. Smart Canucks - A good site for finding Canadian coupons and deals. Drudge Report - Links to various news stories, conservative in tone. Jesus declared, "The Son of Man did not come to be served, but to serve, and to give his life as a ransom for many" (Mark 10:45). The Greek word translated "for" is anti, which means, "instead of, in place of." On the cross, Jesus died instead of us, in our place. 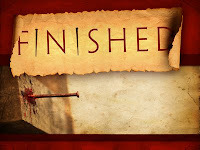 Just before His death on the cross, Jesus cried out, "It is finished!" (John 19:30). The original Greek could also be translated, "It is fulfilled!" or "It is completed!" or "It is accomplished!" What was finished/fulfilled/completed/accomplished? This Sunday I am beginning a four-part series called Finished. In this series I will present four accomplishments of Christ on the cross. Are you living for the applause of people or the approval of God? Becoming obsessed with what pleases people is the quickest way to forget what pleases God. As followers of Christ, we need to constantly remind ourselves of the following fact: "I can't please everyone, but I can always please God."